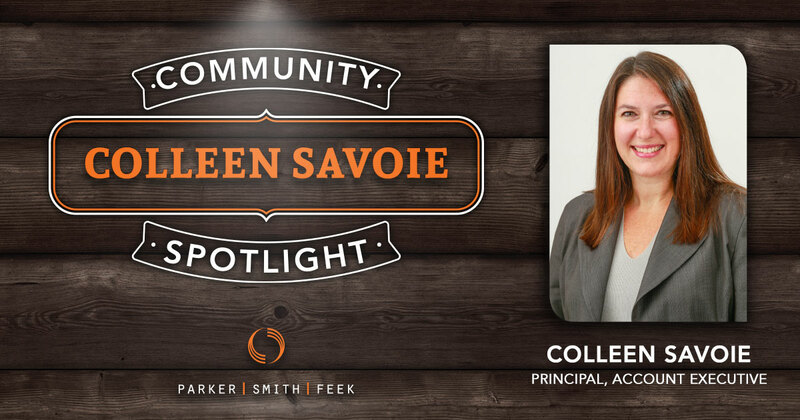 When Parker, Smith & Feek Principal, Board Member, and Benefits Account Executive, Colleen Savoie, first moved to Alaska, she’d never had pets of her own. That changed upon arriving to the Great White North, when she and her husband, Thomas, happened upon a litter of stray kittens. Colleen and Thomas set to work finding other homes for all but two of the furballs, whom they named Mooch and Peeper. 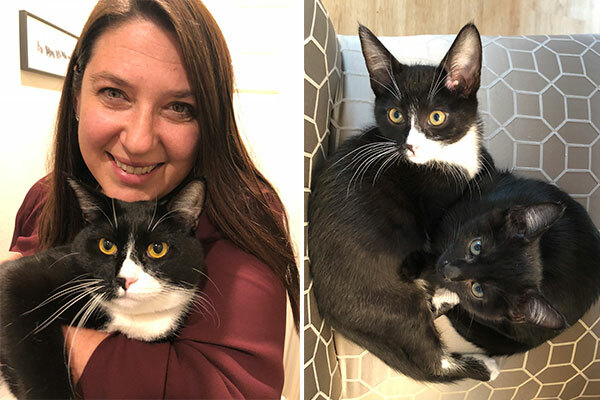 For Colleen, that was just the beginning of her dedication to helping animals, and the first of many times that she and Thomas would need to help rehome or return lost pets. Colleen has come a long way and accomplished much for Alaska’s animals since that first feline encounter. 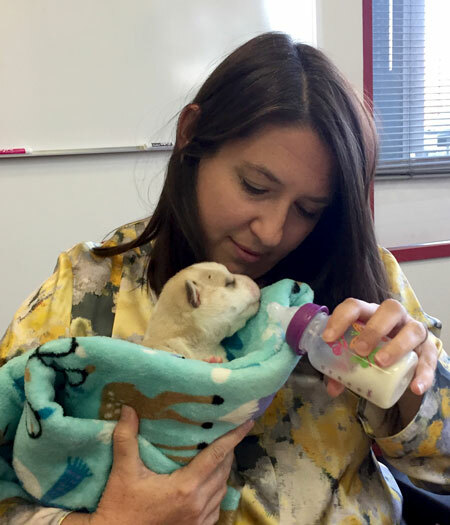 In early 2016, she joined the Alaska SPCA Board of Directors, and stepped into the role of Board President just one year later. She’d gone from no pets at all to leading a nonprofit dedicated to providing low cost services to the pets of the entire state of Alaska. In 2015, the Alaska SPCA opened an adoption center to take in strays or animals that can’t be placed and the adoption center is still going strong today. Oftentimes, those animals come from other regions in the state or other shelters that don’t have adequate capacity. They administer wellness exams, vaccinations, and spaying or neutering to all incoming animals, when necessary. They always try to ensure that, when you adopt from Alaska SPCA, your new pet is in the healthiest condition possible. They also operate a clinic, which initially focused on providing low cost vaccinations, neutering, and spaying. Last October, the Alaska SPCA team opened a new expanded clinic to offer even more services, including dental cleanings, surgeries, digital x-rays, and more. They now employ three vets to help care for Alaskan pets. During this time, the organization was undergoing some operational changes, and Colleen shepherded the transition to a new Executive Director, Pam Meadors. Colleen credits the new clinic’s success to Pam’s passion for animals and incredible hard work over the past year. “We made some significant changes to the animals we were taking in. It’s been a fun project.” Pam says. She’s referring to the clinic’s new offerings, including the ability to accept surrendered animals in certain circumstances, as well as animals with special medical needs from Anchorage Animal Care and Control and surrounding open shelters. Even senior pets have a place with the SPCA; a 15-year-old toothless chihuahua named Chiquita was among their recent adoptions. The new clinic has provided spay/neuter, wellness, vaccination, and registration services to thousands of animals in the first year alone. As always, the services are provided at a very low cost. “We really try to help members of the community who are facing the choice of whether to buy groceries or pay rent, versus taking their animal to the vet.” Pam says. The State of Alaska itself presents a challenge to that mission. Much of the state’s population lives in rural, off-road communities that are flung far afield. As Pam says, “We’re the Alaska SPCA, not just the Anchorage SPCA. We need to be able to reach more of our Alaska neighbors and work with other agencies.” Luckily, the Alaska SPCA has a mobile unit to do just that. Colleen and the Board greenlighted a partnership with Alaska Rural Veterinary Outreach (ARVO), which allowed the Alaska SPCA to provide care to off-road communities, specifically. Through that partnership, their veterinarians can now reach places as remote as Nome, among others. A major upcoming mobile clinic in Soldotna is already inundated with requests for appointments and services. At times like this, the gravity of the Alaska SPCA’s mission becomes clear. It’s not just the pets that need help, their owners and families need both financial and emotional support. For that reason, they also operate a pet food bank within the adoption center, as well as a thrift store. Currently, they are working to partner with other food banks in the area to share resources and make more items available to more people in need. This is nothing new; the Alaska SPCA makes a point to work with other groups to improve their community as a whole. They even employ differently abled individuals through the Arc of Anchorage, who have proved to be wonderful assets to the Alaska SPCA as a whole. Volunteers, donors, and other organizations were instrumental in the opening of the expanded clinic, as well as keeping other resources up and running. Their mobile clinic’s success relies upon the generosity of the visited community to help house the veterinarians and staff, and provide operational support. For Colleen and Pam both, the community impact and resulting collaboration are some of the most rewarding aspects of their roles. “We all have the same goal. It’s about the community. It’s about public health. It’s a really important mission,” Pam says proudly. Outside of their pet-focused goals, the Alaska SPCA does host occasional events to thank the community for its contributions. When the clinic first opened, they hosted a tour for clients, the community, and veterinarians that was a great success. This year, they will be having an anniversary party for the clinic’s opening on October 21st at the Writers’ Block Cafe. For Colleen and Pam, it’s a chance to say thank you to the people who have helped make the Alaska SPCA what it is, and also those who it seeks to help. If one thing is for sure, it’s that animals will continue to be a major part of Colleen’s life. She and Thomas have two new rescue cats at home, brothers named Felix and Figaro. To learn more about the Alaska SPCA, volunteer, or to get involved, visit http://www.alaskaspca.org.